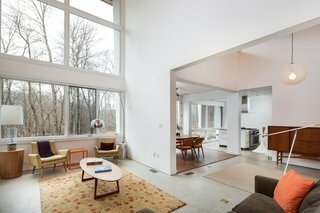 An energy-efficient, rural retreat designed by owner/architect Lynn Gaffney hits the market. Back in 2009, we recounted Gaffney’s quest to design the eco-friendly property for herself and her husband, which would serve as a weekend getaway from their home in New York City. Now, nearly 10 years later, the owners are putting their pet project on the market for $650,000. 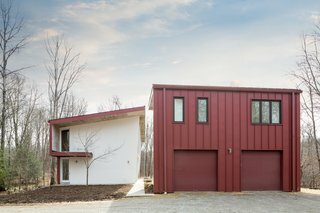 Inspired by Gaffney's fascination with sheds and barn-like structures, the innovative design located in Sharon, Connecticut, reflects this influence. 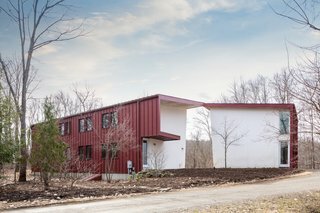 Sustainable materials include the prefabricated structural insulated panels (SIPS) that have been used instead of the usual stud and frame construction, as well as the use of bamboo and concrete flooring. 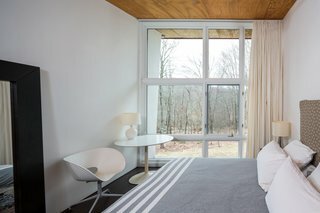 Rooms feature 18-foot ceilings and are flooded with light via the many expansive windows, which also allow for grand views across the eight-plus private acres of land. Scroll ahead for a look inside this fascinating home. 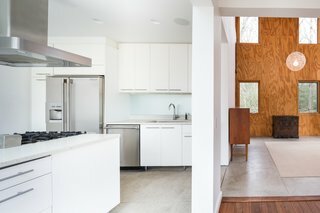 The home has a unique industrial aesthetic thanks to the use of eco-friendly structural insulated panels (SIPs) that are prefabricated off-site, manufactured with a minimum amount of waste, and then quickly assembled on the property. The overhang assists in keeping the home cool in the summer, as it blocks some of the sunlight. 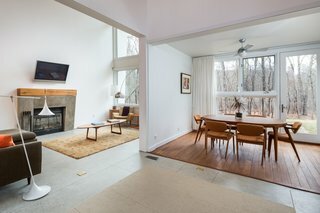 The open layout on the main level includes the living room with a fireplace, the dining room, and the kitchen. 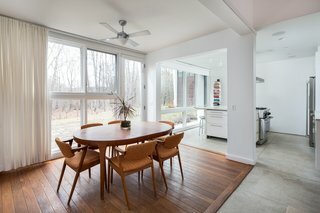 Meticulous positioning for solar energy keeps the home warm in winter, along with the floor-to-ceiling windows that help heat it during the day. Wood flooring delineates the dining room area. 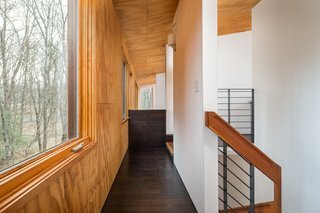 The double-height living area features unfinished plywood cladding. The sleek, contemporary kitchen features a center island, as well as stainless steel appliances. The large windows bring in so much natural light that the home rarely needs electrical lighting throughout the daytime. Two bedrooms and a full bath are located on the main floor, with the master bedroom suite on the second level. 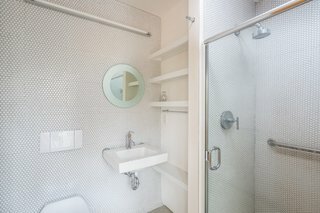 In the guest bathroom, penny tiles have been chosen for their cost-effectiveness. Above the two-bay garage is a guest apartment (approximately 600 square feet.) that features a sleeping alcove, kitchen, bath, living room, laundry area, gas fireplace, and balcony. 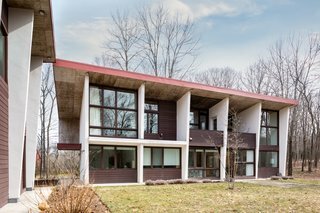 5 South Ellsworth Road is now being listed for $650,000. See the full listing from William Pitt • Julia B. Fee Sotheby's International Realty here.